From my perspective, Charles Krauthammer’s column on why he is voting “for the guy who can tell the lion from the lamb” expresses the substantive reasons why I support Sen. McCain and have concerns about Sen. Obama. I also thought his follow-up column was excellent. Here are some other opinions that I find compelling, from PowerLine, Thomas Sowell and David Frum. But given the political tilt I see in the social media world (particularly in Twitterville), I also wanted to be on the record expressing my hope that Sen. McCain will be elected today. If professors at state-funded universities can express their political opinions at taxpayer expense, it seems fair for the Chancellor of a virtual university that receives no government funding (or funding of any kind, for that matter) to have the same academic freedom. If Sen. Obama wins, I will hope that I’m wrong about him and will pray the best for him and for the rest of us. Sen. Biden’s Macaca Moment: Pandering or Unguarded? As part of the SMUG Political Science seminar series, we’ve previously looked at the use of social media by the McCain and Obama campaigns. The campaigns and their cohorts have created platforms for their supporters to interact and express themselves, and also have established outposts within the major networking sites like YouTube and Facebook to interact directly with voters instead of completely relying on mainstream media. But the essence of social media — and its real power — is that anyone can use it. When former Sen. George Allen (R-Va.) had his macaca moment in 2006, it seemed he went out of his way to cause the problem for himself. He knew a Democrat operative was following him and specifically called attention to that person before using the word that has come to symbolize the power of unscripted video posted on YouTube to influence an election. When you know, as Sen. Allen did, that a video camera is pointed at you, you had best be on your guard. To paraphrase Miranda, you know that what you say and do can and will be used against you in the court of public opinion. But what if you don’t know the camera is there? I’m thinking this video of Sen. Joe Biden, Sen. Obama’s running mate, on a rope line in Ohio was taken with a Flip camera, or another similarly small point-and-shoot video recorder. He doesn’t seem to notice the camera. At a campaign stop in 2006 All American City, Maumee, OH Joe Biden talks to a 1Sky campaigner about energy policy. Biden is called out on his platform that includes coal. Both 1Sky and the Energy Action Coalition are opposed to the development of new coal fired power plants. Energy Action Coalition is running Power Vote, a national youth based campaign to get 1,000,000 youth voters voting for clean energy this election season. And just to clarify, the campaign stop happened just last week; Maumee was an All-American City in 2006. For those unfamiliar with the electoral implications, neighboring Pennsylvania is a huge coal-producing state and also is a Keystone (pardon the pun) to the Electoral College math that will decide the presidential election. The McCain campaign immediately jumped on this statement and its negative impact for Pennsylvania jobs, and the Obama campaign accused the McCain campaign of distorting Biden’s position. He was captured in an unguarded moment, saying what he really thinks about clean coal. Am I missing something? Is there another interpretation that could fit the evidence you see in this video? Either he misled the activist in what he thought was a semi-private conversation (with hundreds of people around), or he’s being less-than-truthful about his support for clean coal. That story may be apocryphal, so don’t add it to Sen. Humphrey’s Wikipedia entry, but the advent of mass media made this kind of pandering more difficult, or at least more costly when politicians were caught. Now the stakes are even higher. With ubiquitous recording devices in the hands of both opponents and average citizens, candidates can’t afford unguarded moments or pandering, because what they say will come to light. Sen. Biden comes across as arguing fairly passionately against coal, but I’m no mind reader as to his actual position. To borrow a phrase, “That’s above my pay grade.” 😉 Voters (especially in Pennsylvania) may judge for themselves whether they think he was pandering or expressing his heartfelt opposition to (even clean) coal. Or this video may just contribute to voter distrust, because this is worse than just a flip-flop in which a candidate was “for it before he was against it.” This is saying two different things about the same issue at the same time. One more item: as surrogates for Sen. McCain and Sen. Obama were making the post-debate TV rounds last night, Sen. Biden dropped this gem about having devised “with Barack” the strategy that Gen. Petraeus is using. Jeff Emanuel has a good analysis of this. And it just shows that candidates can say things that damage their credibility even when they’re fully prepped and aware that they’re on national TV. And in our SMUG spirit of bipartisanship, although I support Sarah Palin and share her values, this answer to Katie Couric wasn’t her best moment, either. What other macaca moments have you seen this year, from candidates of either party? Please share the links in the comments below, and I will update this post to reflect your contributions. Author Lee AasePosted on September 27, 2008 Categories Social MediaTags Biden, Coal, McCain, Obama, Social Media, YouTubeLeave a comment on Sen. Biden’s Macaca Moment: Pandering or Unguarded? 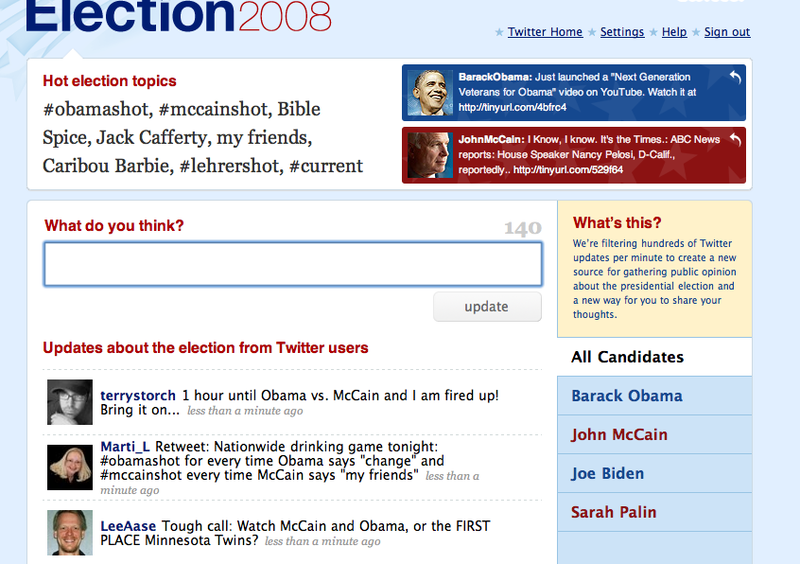 If you haven’t checked out this Election2008 site on Twitter, you really should. It’s a great way to see a real-time political pulse, although the population of the Twitterverse seems to be pretty skewed to the left/Obama side. I expect the Twitter pace will pick up through the night. In the past, a campaign team may have overreacted to a video such as Obama Girl or been concerned about not having a say in the messaging behind a video such as Yes We Can. Instead, the Obama team has embraced these videos and recognized the value and power of user-generated content in moving others to action. That’s a really crucial change in the media landscape, and it’s here to stay. Candidates formerly would try to control the campaign’s message, but that has become extremely difficult if not impossible. As Scott mentioned, Obama Girl had a brief period last summer in which she essentially dominated the campaign news. And just as we will expect to see Obama-McCain and Biden-Palin debates in the next 60 days, there is also a “Candidate Girls Olympics” competition. Social media are more than just “new media.” I define new media as a way for organizations to bypass the mainstream media and deliver content directly to audiences. Social media means they aren’t “audiences” anymore. They can and will talk back, whether on social networks or through their own blogs. As Scott said, it’s encouraging that both of the major campaigns have significant involvement in social media. (You can read about the McCain effort in Social Media 301.) But whether the campaigns are participating or not, the reality is that with the widespread availability of these cheap and easy tools, rank-and-file people across the political spectrum will be engaged on-line in this momentous election. Visit any of Obama’s networking tools and you’ll find a donation widget. He’s engaging target audiences on their own turf and using these tools and platforms to motivate others to donate and help drive others back to his website. All these tools are serving as key extensions of interaction and user involvement but centered around a clear call to action. It really is brilliant. You see a great video on YouTube that inspires you to participate, whamo, the donate button is a simple click away. Check out the rest of Scott’s analysis on his Social Media Snippets blog.